A very nice and original recipe, pairing cheese and chocolate! Don't run away, those two magical ingredients goes perfectly together in Céline's recipe. 1. Pre-heat oven (180°C). Roast the sweet potatoes wrapped in foil paper, during approximately 40min. When they are tender, squash them with a fork. Add salt, pepper, and if needed a bit of cream. 2. Mix the flaked almonds in a bowl with honey, cinnamon, finely sliced prunes, chocolate, cider vinegar, until you obtain a thick paste. 3. Slice the cheese in small rectangles and each pastry sheet in 2. Put the sheet on your work surface, folding the bulging part. Place one cheese rectangle on one of the extremities, a small spoon of the chocolate condiment, and cover with another rectangle of cheese. Fold the sheet to shape your samosa. 4. Butter the samosas with the clarified butter, and put the whole in the oven for 15min (180°C), flipping them over at half the time. Before serving, dust the samosas with icing sugar. 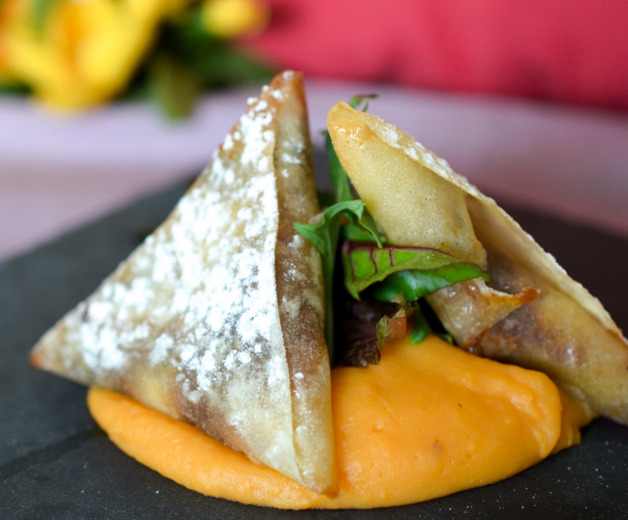 On your plates, drop a spoon of puree, add a bit of salad and place 2-3 samosas facing each other.